It’s long been a key feature of the postwar American dream: hardworking Americans look forward to trading their 9-5 jobs for leisure activities somewhere around age 65—until now. Unlike the several generational cohorts before them, baby boomers have not embraced traditional retirement with open arms. Now, more and more people entering retirement age are finding they aren’t ready to leave the workforce entirely. As with all demographic trends, the reasons for this are complex and vary from person to person. However, one factor may be medical advancements that allow people to feel physically and mentally healthier for longer than their parents and grandparents did. So might the fact that as people reach retirement age, they’re finding the money they’d saved for decades won’t provide the lifestyle they want for very long. It could also be that the idea of “death by retirement” has caught on; people who retire earlier tend to also die earlier, according to some studies. A combination of these reasons, along with the mental stimulation, social engagement, and sense of purpose that work provides, mean that the over-65 crowd isn’t exiting the labor force as enthusiastically as they were expected to. Often this means delaying retirement and continuing to work at the same job longer than planned. But for a growing group of people, it means something else: an encore career. 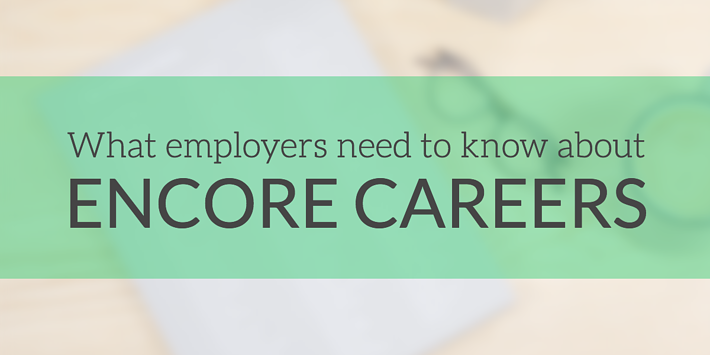 What is an encore career? An encore career refers to a career change later in life. For many would-be retirees, it offers the chance to pursue professional interests that weren’t a factor in their previous careers. Some encore workers will still approach this phase of their careers with the same drive and competitiveness they brought to their initial career paths. Others may view an encore career as a way to continue earning money, but on a more flexible work schedule, or in a less high-stress position. Some people in this phase prefer to simply call it an “encore,” since the word “career” often connotes a focus on achievement or financial gain that may not be relevant to everyone. According to Encore.org, some people who choose to transition into an encore “are able to do so as unpaid volunteers or in roles in their communities or families.”For these people, calling their second act a “career” isn’t accurate, since it may be more of a passion project with little or no pay. Whatever form they take—either as a paid position or volunteer work—encores are a way for people who have left their original career path to continue to keep their skills sharp and explore their interests. For people seeking work in the same or a related industry to their previous career paths, their relevant experience can be incredibly useful to their new employers. Highly-tenured workers bring confidence, wisdom, and time-tested ways to solve common industry problems. Employers can also consider putting some of their encore talent in mentorship positions to develop newer staff members. This is a great way to help create strong working relationships between people of various experience levels, and to honor the contributions of more seasoned workers. Even if they’re looking for work outside their original career paths, encore employees often have a track record of professionalism and commitment that speaks volumes about their potential as employees. An encore employee trying their hand in a new field may bring the same kind of energy, enthusiasm, and curiosity to the role as their younger counterparts. And since diversity of all kinds (cultural background, experience, etc.) has been shown to lead to better outcomes, an age-diverse workforce presents great opportunities for growth and innovation. Encore.org notes that “millions are determined to apply their experience to make a difference for others. And they are looking for a new model combining elements of work, service, and social impact.”For those who keep track of broad generational prognostications, the phrase “social impact” may sound familiar: it’s been cited as a key factor for millennials when choosing a career. Millennials, many of whom now find themselves in management positions, may be in a unique position to relate to encore job seekers. Nonprofits and companies with established corporate social responsibility or volunteer initiatives will likely find themselves at an advantage when it comes to attracting and retaining people from both groups. Also, just like younger workers, most encore employees are looking for flexibility in their work arrangements. After years of working in more structured environments, many people who opt for an encore appreciate the freedom to work remotely, take occasional time off for travel or leisure, or schedule around personal appointments without hassle. Company leaders in industries with more rigid work cultures should start to try to loosen their expectations about when and where employees do their work to avoid missing out on the best talent—whether highly tenured or newly graduated. Several decades ago, most people in the baby boomer generation would have likely predicted that they’d retire comfortably by their mid-60s. But as they get closer to that age, the realities of retirement have made that a less appealing prospect. For many sharp, energetic workers who still have ample curiosity, passion, and drive, the prospect of continuing to contribute to the workforce in some capacity—paid or unpaid, full-time or part-time—has made encores a trend with staying power. Employers who provide flexible, meaningful, exciting work can harness this opportunity for the benefit of their entire staff.